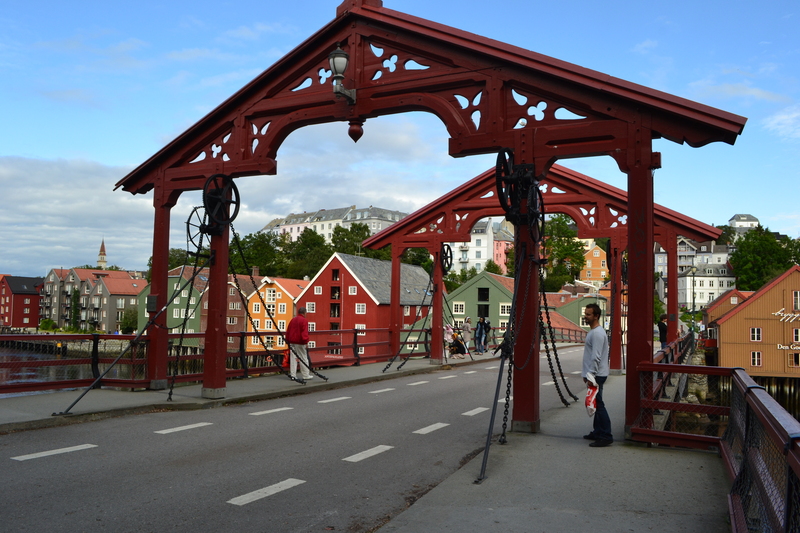 Trondheim is a historical city that was founded in 997 by the viking king Olav Tryggvason (which means I’m a viking!). 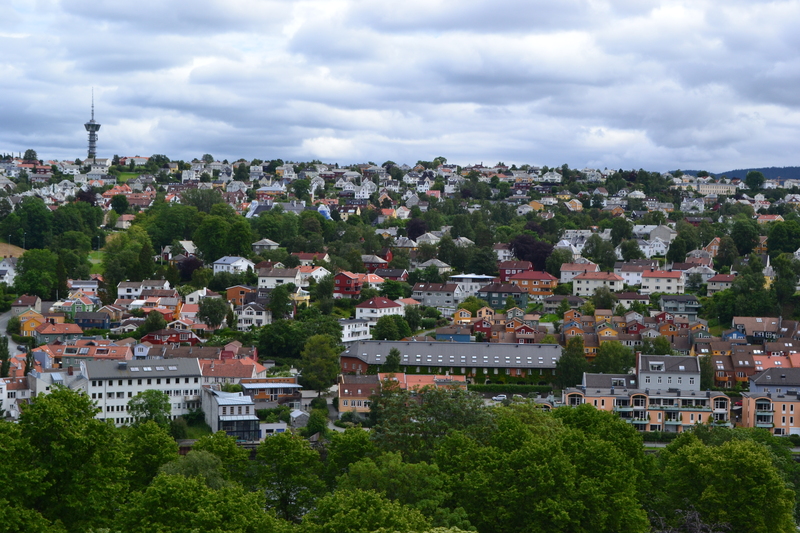 It has a population of a bit over 181,500 people and is therefore the third largest municipality in Norway. 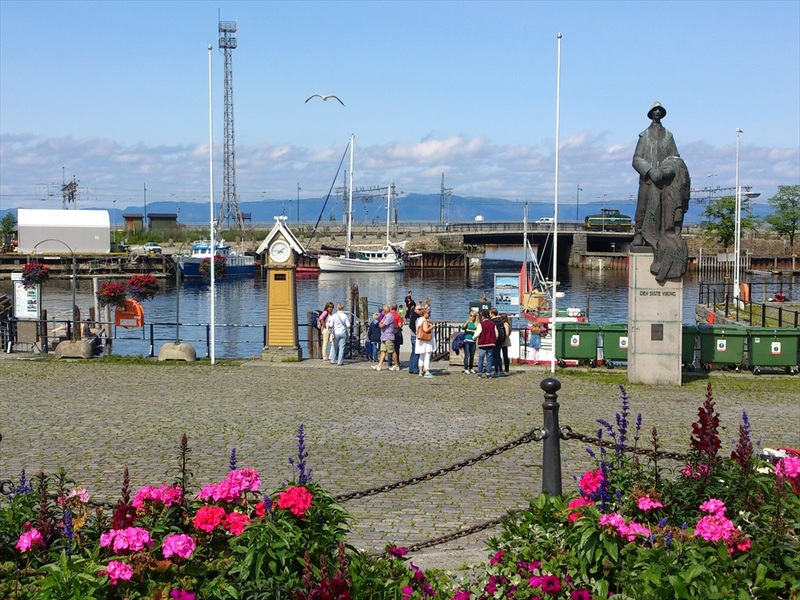 The city has changed name several times from “Nidaros” to “Trondheim”. The latter means “the home of the Trønder people”. 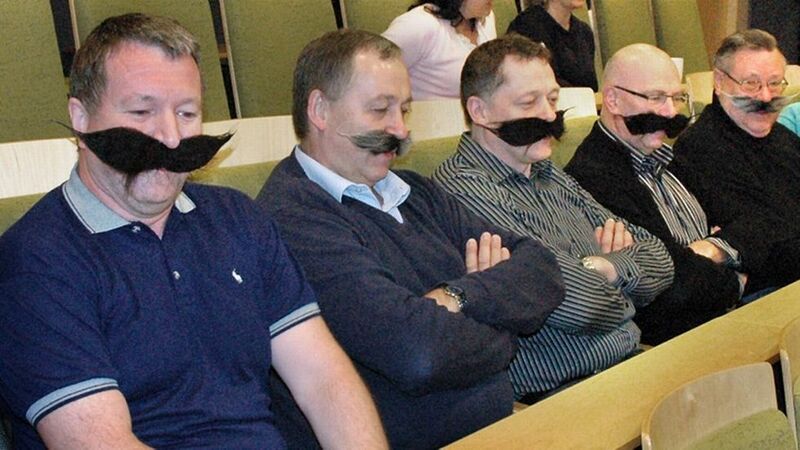 Trønder people are famous for wearing “mokkasiner”, leather vests and for having a moustache. Even though this is not as common anymore you can still see some real old school Trøndies walking around in the streets with their handlebar moustache, also known as “snurrebart”. Trondheim has some very famous rock stars, such as Åge Aleksandersen and DDE. If you ever consider going to a Trønder party, knowing the lyrics from some of the songs are highly recommended. 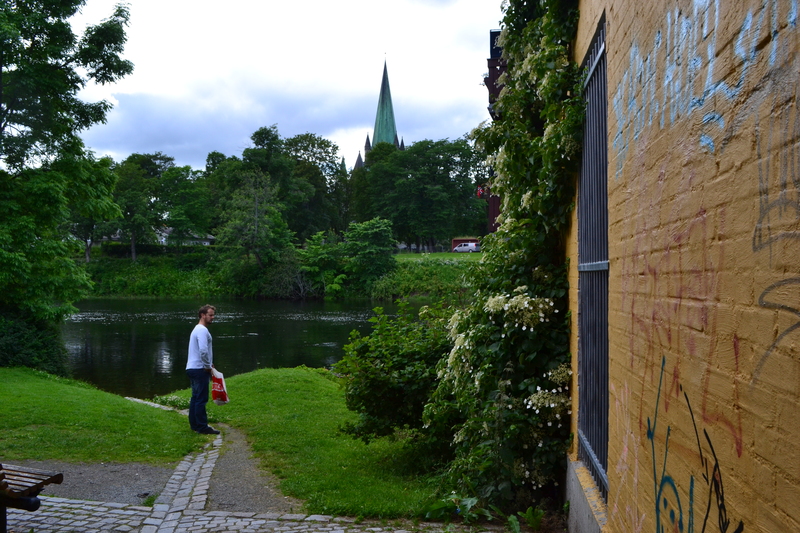 Take a stroll through Old Town, also known as Bakklandet. Bakklandet is an idyllic neighbourhood with old timber buildings located on the east side of Nidelva. 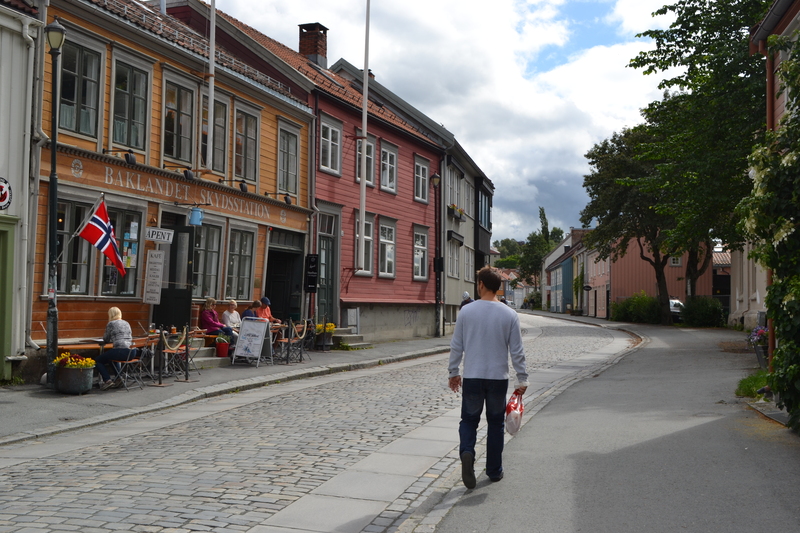 It was first built in the 17th century and used to be the homes of the Trondheim working class. It is now restored, and you can find heaps of charming shops, cafeterias and bars among the cobblestones. Due to the cobblestones, walking in high heels is not recommended! Push-biking on the other hand is very handy. You’ll find spots to park your bike almost everywhere. If I were to recommend just one place to eat and have a drink in Trondheim, I would definitely go for Baklandet Skydsstasjon. I went there for the first time this summer, and I was blown away by the food. I didn’t know traditional Norwegian (and Danish) food could taste that good! 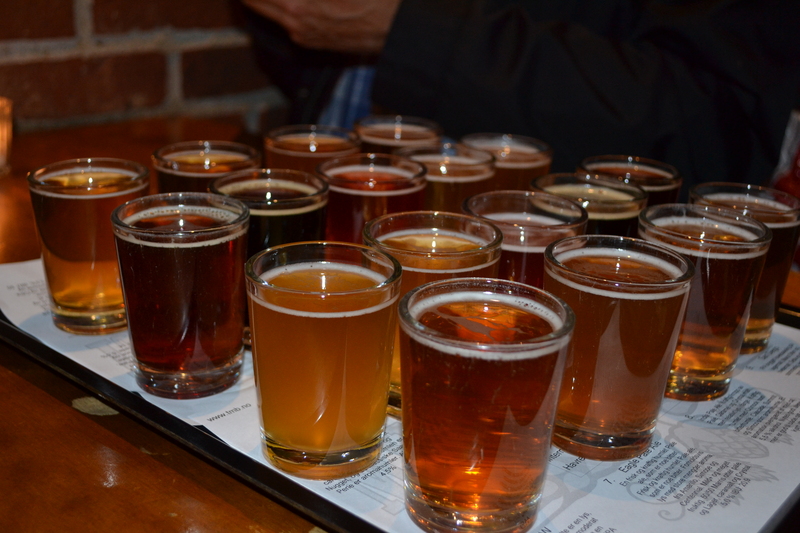 They also have locally brewed beers and over 50 aquavits to choose from. I’m usually not a big fan of aquavit, but when in Rome, right? They do give recommendations for drinks to go with the food, and it’s absolutely worth going for what the waiter recommends. One of the best and most charming eateries in Trondheim for sure. Even National Geographic agrees. 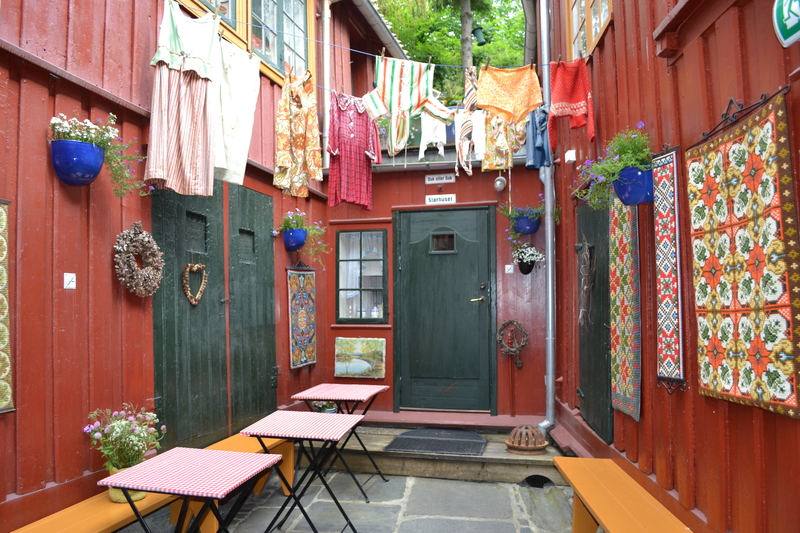 The backyard of Baklandet Skydsstasjon is very charming and different where you can see collectables of antiques. Back in the Viking days the little island just a quick boat ride outside from the centre of Trondheim used to be an execution site by the jarls. The heads of two of the viking king’s rivals were placed on stakes overlooking the fjord to serve as a warning to visitors. 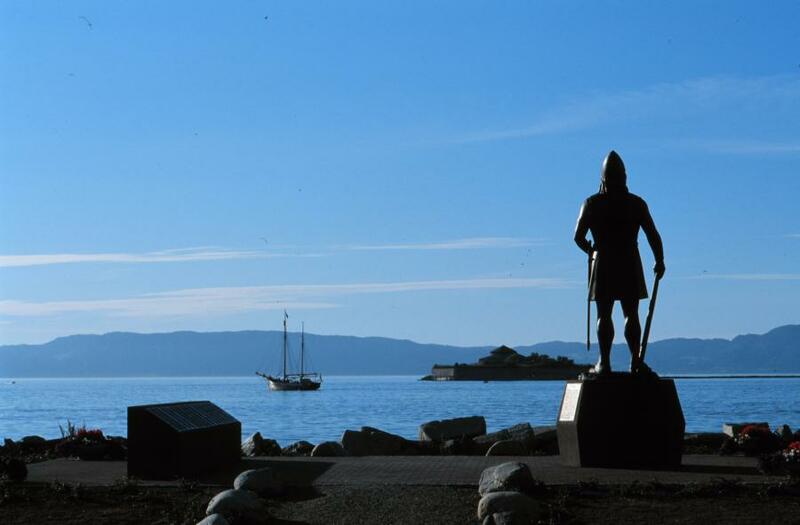 The tale says that new visitors had to go to the island and spit on the heads as a tribute to the viking king before they were allowed to enter the city of Trondheim. Luckily, now days there are no heads on stakes anymore and the lovely island is now used as a popular summer spot for the locals and tourists. You can take a historical tour with a guide or just stroll around the island in your own company, have a picnic and go for a swim. During the summer months a boat is going from the Ravnkloa harbour to the Monks’ island frequently. 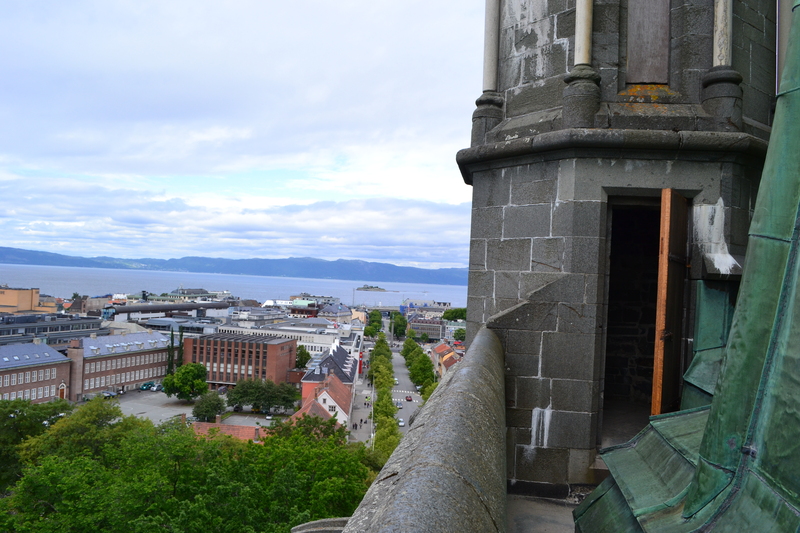 From the tower of the Nidarosdomen Cathedral you one can see out to the Monks’ island. The Nidarosdomen cathedral was first built in the 11th century and is one of the largest medieval buildings in Scandinavia. If you are a bit into history visiting the cathedral’s crypt is a must. Here several old and fascinating tombstones are in display and you can still read some of the inscriptions in Latin and Old Norse. Climbing the tower is also worth giving a shot, as long as you’re not claustrophobic. The old Trøndies really had to be small back in the days, because the stairs are tiny! 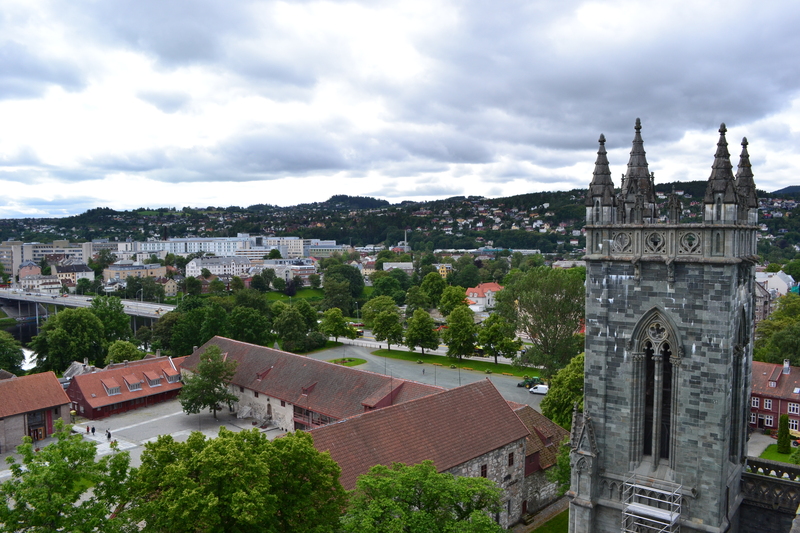 After 172 steps you’re finally at the top and you’ll have an magnificent view over Trondheim. 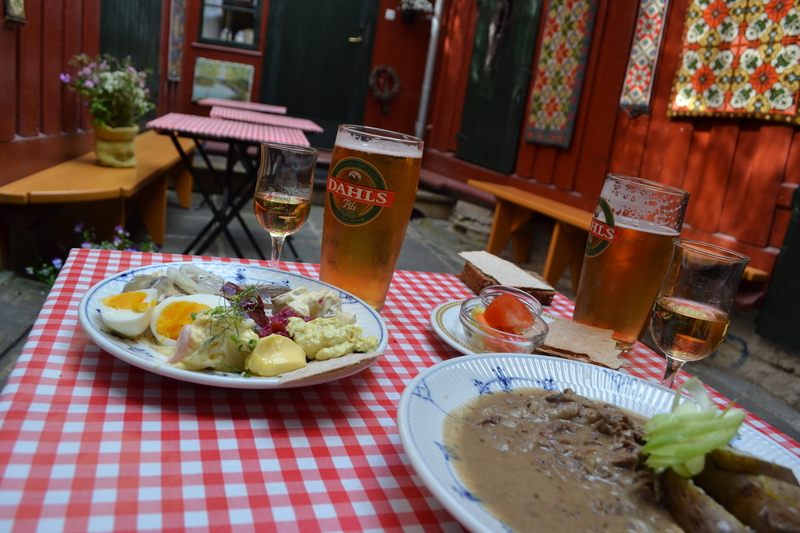 Did you know that Norwegians are the only country having a word for drinking beer outside? We call it “utepils” and it basically means having a beer outside in the (cool) air. Trust me on this, as soon as the temperature gauge shows something more than 10*C the Trøndies but on their jacket and sits outside with sunglasses on whilst having an “utepils” at Solsiden. If you’re from further down south the temperature might not be very appealing to you, but it’s an absolutely must to if you would like to live like a local. Us Trøndies barely see the sun, even in the summer months, so when it’s first out we definitely make the most of it. Solsiden is a small strip of restaurant and bars, and is the “go to place” whenever the sun is out. In the last couple of years several new eateries have popped up, so there should be something to accommodate every preference and taste. If you would like to get entertained by watching today’s “jappa” getting drunk on Möet I would recommend going to Søstrene Karlsen, otherwise you can just go there and choose a spot whilst you’re there as many of the outdoor tables can’t be booked beforehand. It might not be the most flash restaurant with a view, but the sushi here is AMAZING. To this day, I still think SushiBar at Ravnkloa has the best sushi ever. And I’ve tasted a lot of sushi in my life. 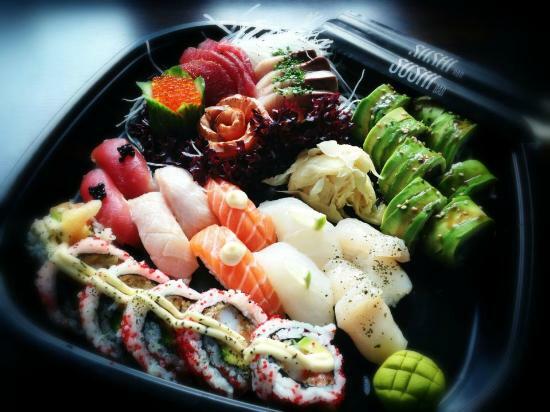 Make sure you order a sharing plate, so you can try a lot of different sushi creations. I always go for the tempura mix plate. I should probably try to be a bit more adventurous next time, it’s just so damn good I can’t help myself! 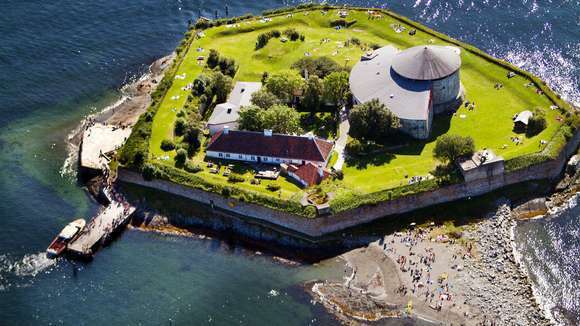 The restaurant is located more or less next door to the harbour with the boat that takes you out to the Monks’ island, so it bight be an idea to merge those two trips together. Two birds with one stone right there. Ravnkloa fish market and harbour is where my facourite SushiBar is located.